The Municipal Buildings opened April 17th 1884 by Mayor, Alderman Edwin Woodhouse, after a competition was held to design them. It was won by George Corson, whose plans included dividing the buildings into the ‘business’ side, which fronted on to Calverley Street, and the ‘popular’ side which led on to Centenary Street, now the Headrow. The popular side was occupied by the Free Public Library and took up less than a third of the whole building including a Reading room, Lending library and Reference library. The vaulted ceiling is covered in mosaic with hexagonal bricks of various colours with golden bosses. These ceiling bosses were part of the Victorian ventilation system, which is still working today. The original reading room or tiled hall measures 80ft x 40ft and is divided into a nave and aisles by arches supported by granite pillars. 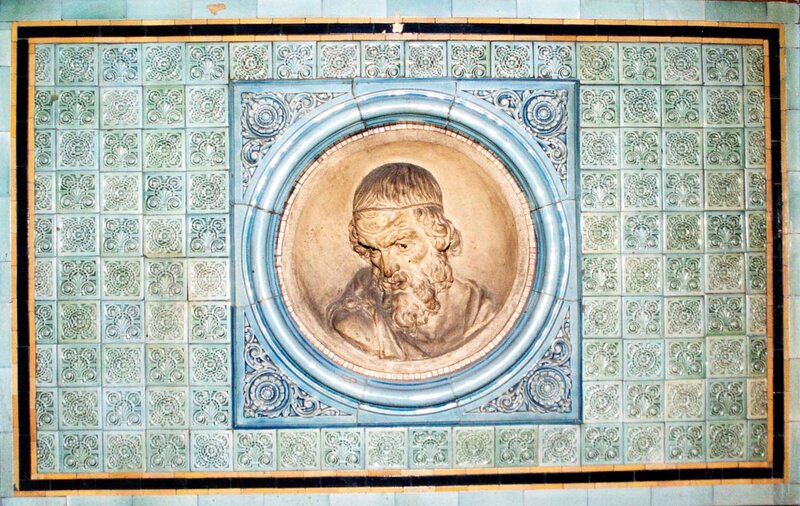 The tiled walls displayed medallion portraits in relief of the great writers Homer, Milton, Burns, Scott, Dante, Macaulay and Goethe. 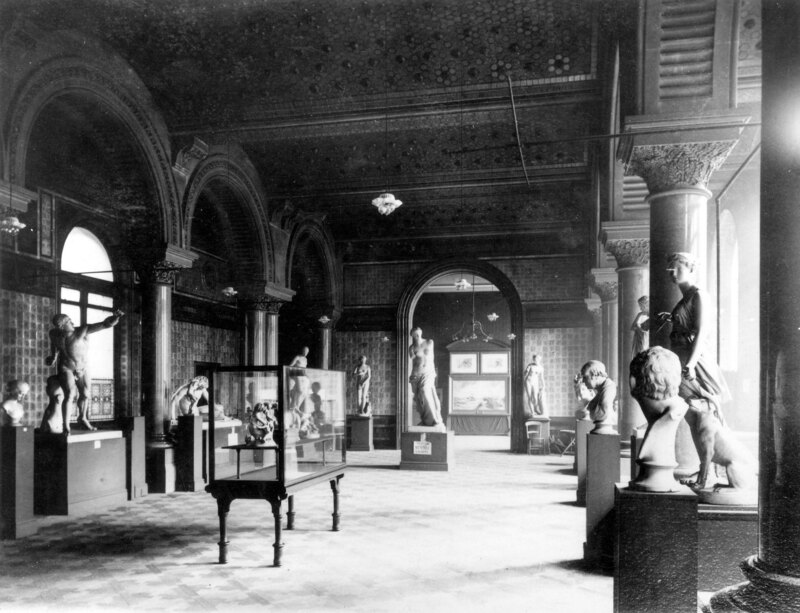 With the Art Gallery built as an extension to the Municipal Buildings in 1888 the Tiled Hall was converted into a Sculpture gallery and the Reading room was transferred into the Art Gallery and renamed the News Room. By 1918 the News room had been converted into the Commercial and Technical Library however the cramped conditions meant that in 1955 it was moved back into the Tiled Hall. 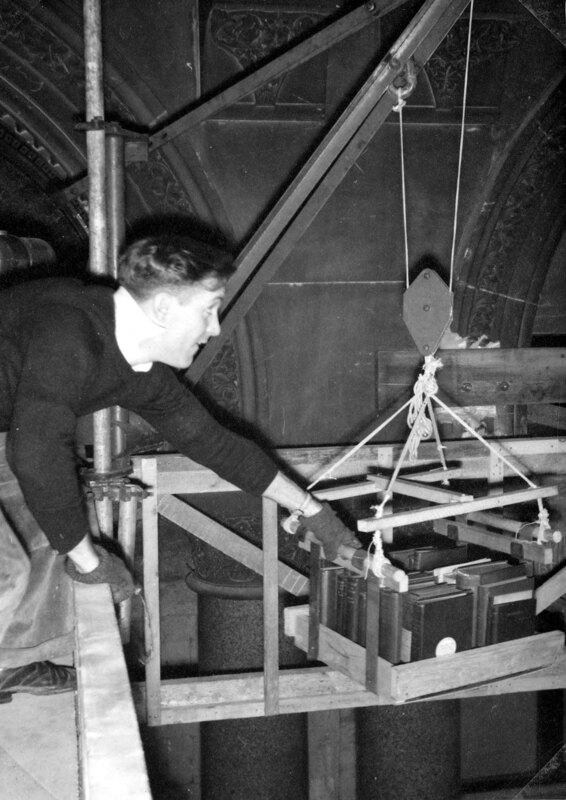 This allowed the Library to expand and have both lending and reference technical collections. The ceiling and walls of the Tiled Hall were then hidden for nearly fifty years behind a false ceiling, bookcases and panelling. 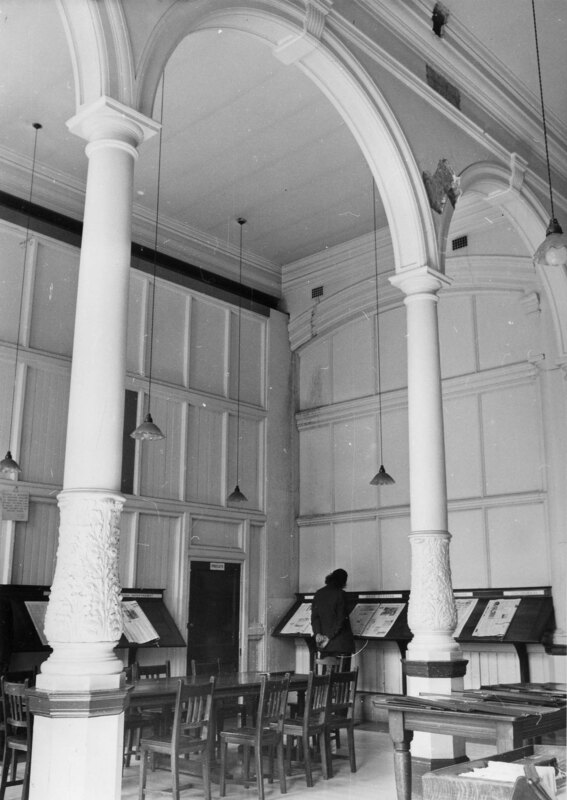 A gallery for staff use was also created in the Tiled Hall where further book stock was shelved, office space for cataloguing services and a staff room created. 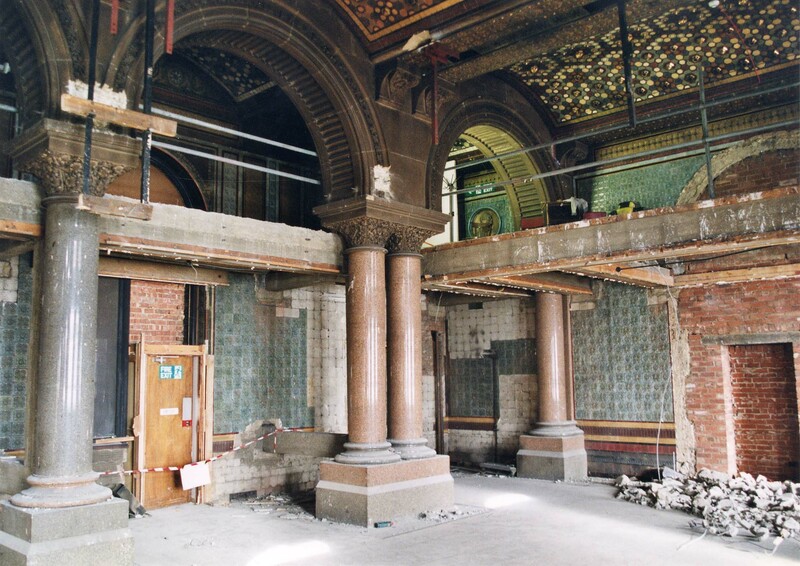 The Music Library was moved into the Tiled Hall space in 1998 but was only there until 1999, when the Central Library building closed for refurbishment and rewiring. 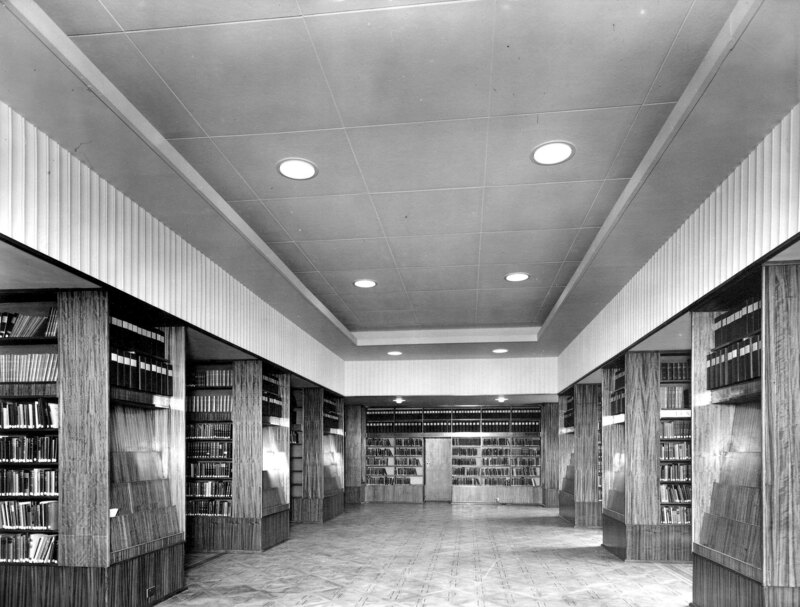 The 1950s panelling and bookcases were removed, along with the false ceiling, revealing, as well as the tiling, the inevitable damage caused by the work done in the 1950s. 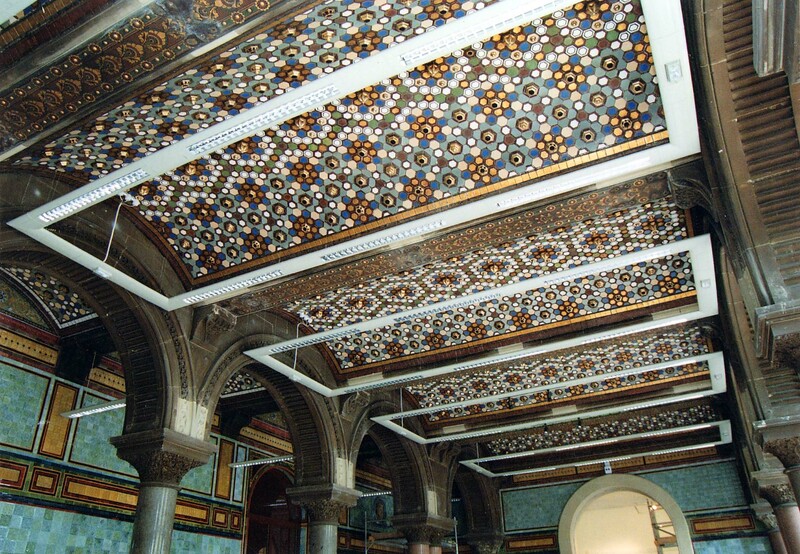 The 1999 refurbishment of the Municipal Buildings was unable to restore the Tiled Hall due to the cost of replacing missing tiles and repairing damage from the Commercial & Technical library’s occupation. For 8 years the space was used in its unrestored state for occasional exhibitions. 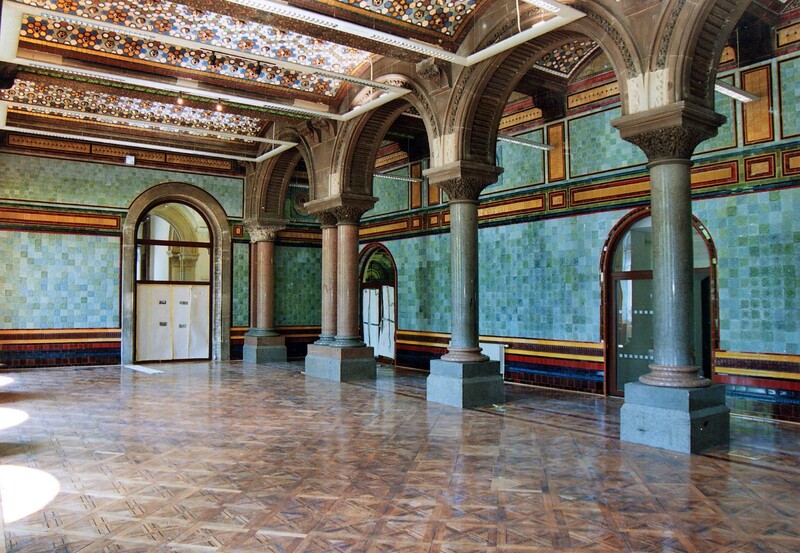 The Tiled Hall was finally restored in 2007 as part of a larger £1.5million refurbishment. Despite tiles being replaced and the floor polished, those with a keen eye can spot the marks time and usage has had on the space. During the restoration the original arch was reopened into the Art Gallery allowing people to flow freely once more between the Library and Gallery. From Reading room to Sculpture gallery to Commercial & Technical Library the Tiled Hall is once again a vibrant and lively meeting space for visitors to the Leeds Central Library. 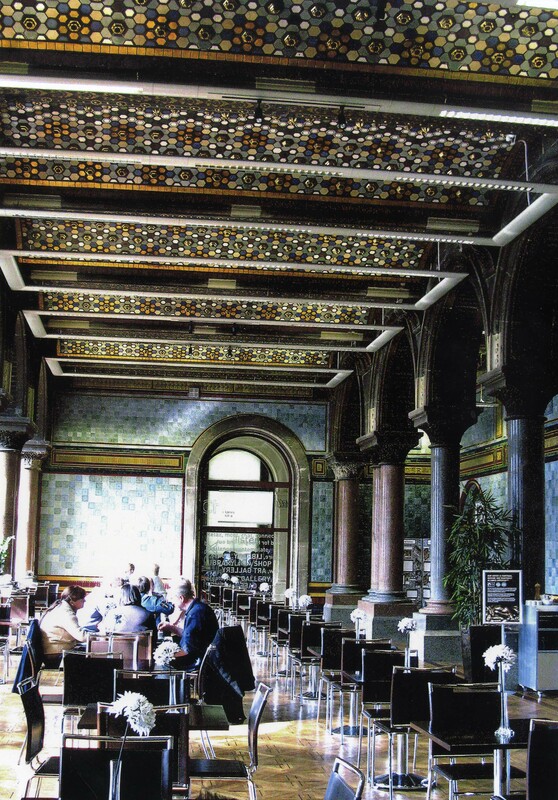 The Tiled Hall now houses a public café however as the space is part of the public library its ‘magnificent’ ceiling and ‘finest’ parquet flooring can be viewed for free by any visitors to the building. A wonderful building to work in which I did for over 25 years so saw much of the various transformations. Can heartily recommend a visit!